At the closing of the Provincial Chapter of Dominican Province of the Philippines on April 2012 held in Manaoag, Pangasinan and Baguio City, Rev. Fr. 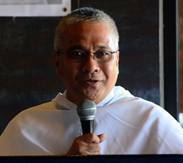 Edgardo D. Alaurin, OP was appointed National Promoter and Director of the Holy Name Society of the Philippines for the next four years. Fr. Alaurin is currently the Regent of College of Fine Arts and Design, University of Santo Tomas. He is a native of Legaspi City where he took his primary and secondary education. He finished his Bachelor's Degree in Philosophy and Theology at the Dominican House of Studies and at the University of Santo Tomas respectively. He holds a Licentiate and Doctorate degrees in Sacred Theology from the same University.